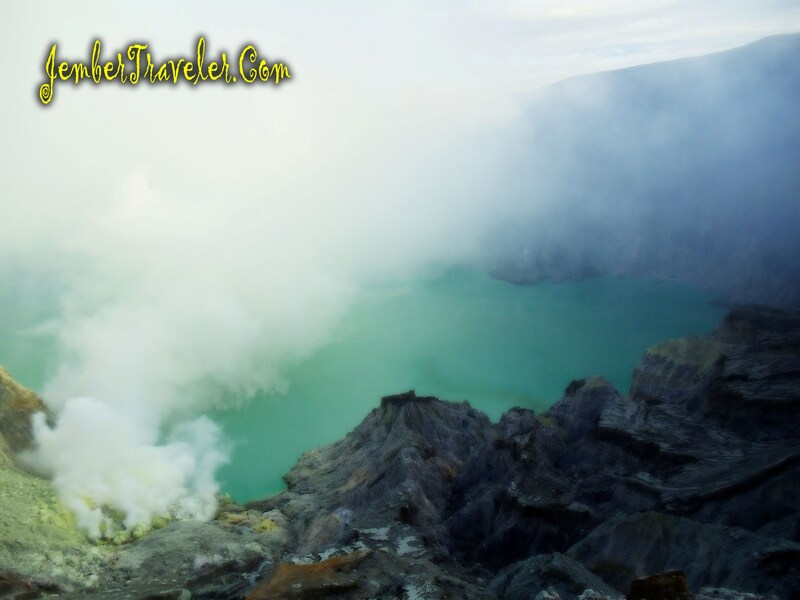 A week earlier, I and my friend, Daniel, made an appointment to go to Kawah Ijen, a mountain near my town which is popular for its beautiful big crater. The day before we left, Ika and Fatah called us telling that they wanted to join. On Saturday evening at 7 p.m. we gathered at Jember Banget Outlet. Beyond our expectation, Miss Eja who was keeping the outlet also wanted to join. So at 8 p.m. she closed the outlet and went home to take some things. Then, we had dinner in Pujasera Sudirman. 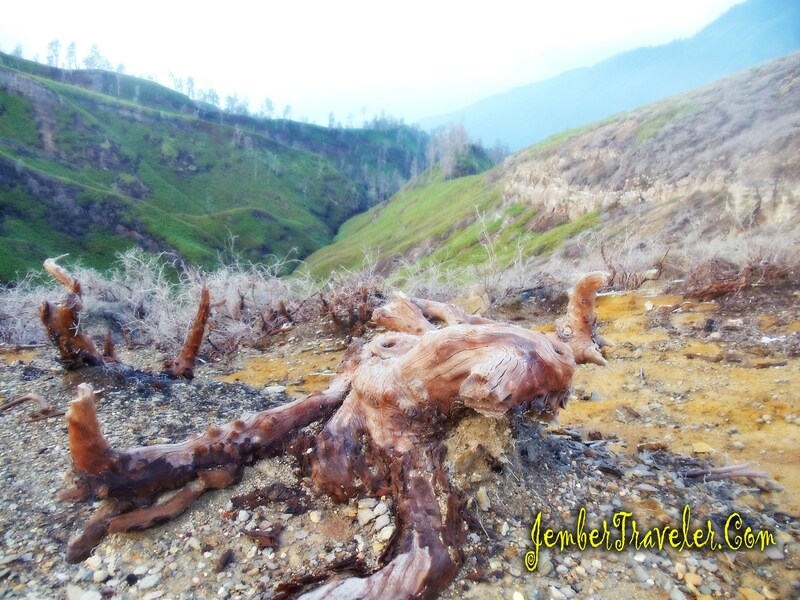 At 9, we left Jember. the five of us rode 3 motorbikes. In Bondowoso, we had a break and bought some food in a mini market. 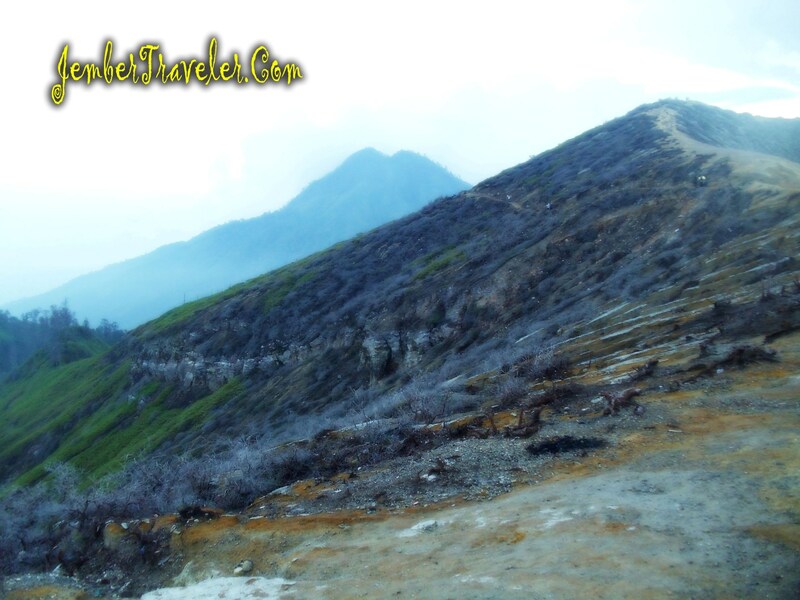 In a blink of an eye, we had already entered Ijen Mountain area. It was cold, and dark; the quiet street also covered our experience. The road, then, raised and became rocky. We stopped at the first post owned by national plantation. Here, we warmed ourselves near a fireplace. Then, the trip went on. 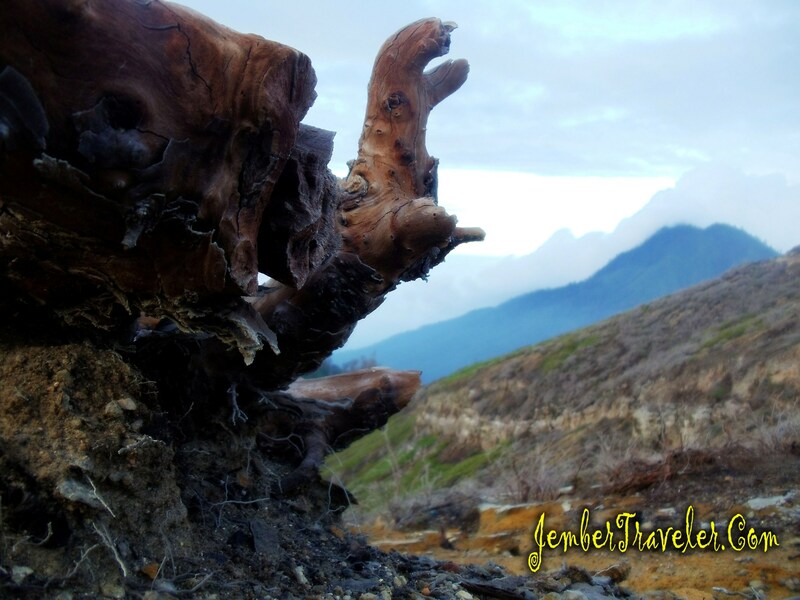 Sleepiness and the cold of late wind, we had to fight them on our way before hiking Ijen Mountain. Finally, we reached the last post where we started hiking at 12 p.m. We had a short break at a café to get some warming drinks and warm ourselves near the fireplace of the café owner. Then we had to pay the entrance tickets and made a written statement before hiking. 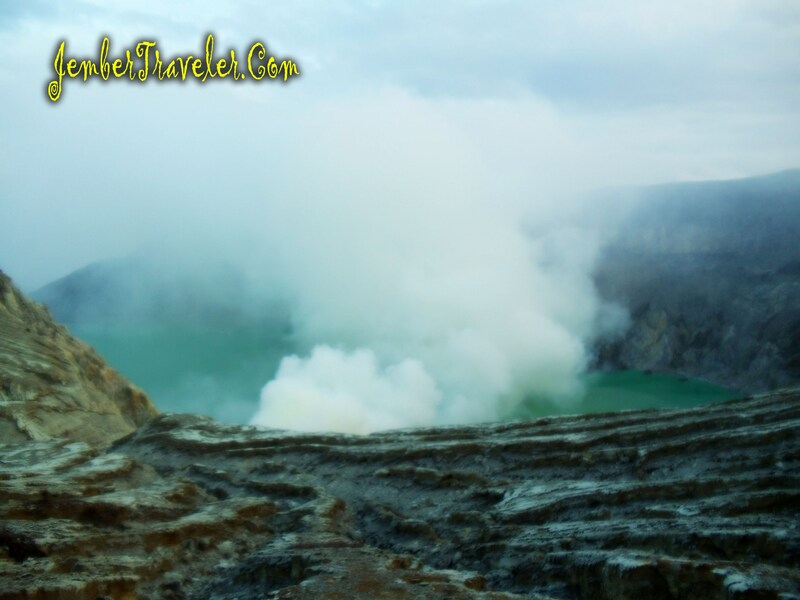 A while later, a group of participants of Ijen Festival arrived at the last post too. Local and foreign tourists participated in the event. We met Andre, Hendri, and Sattar there. They are our friends joining the festival as participants. We climbed earlier than them. With the sleepiness, we forced ourselves to keep walking. The quite high climb had squeezed out our stamina and our feet were weary. We had a break when our member got tired, and at that time, I used it to have a nap. 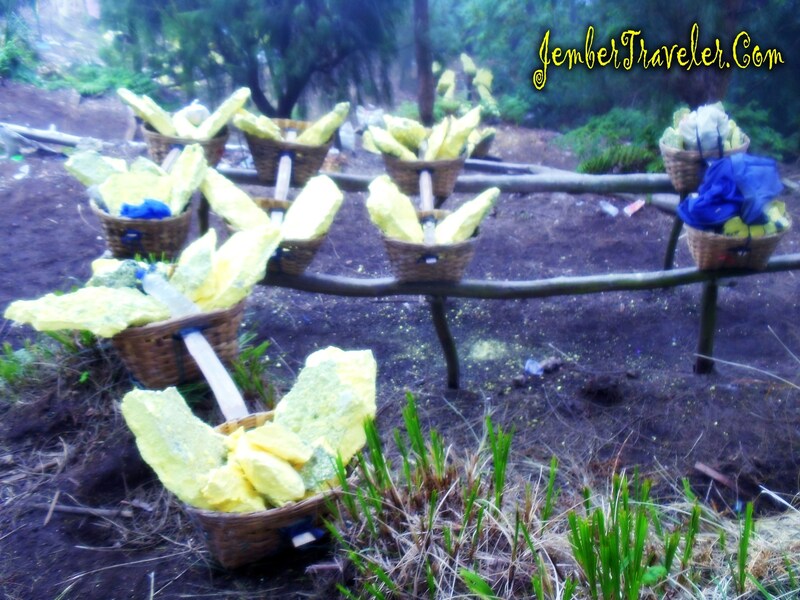 The sulfur miners were passionate to go to the mines bringing torches and baskets. 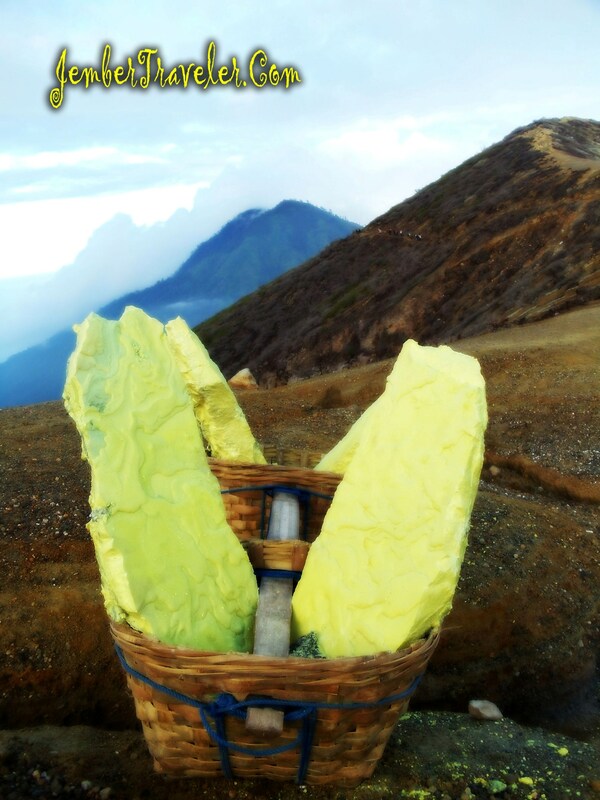 Finally, we had arrived at the peak of Ijen Mountain. We saw the blue fire from there. 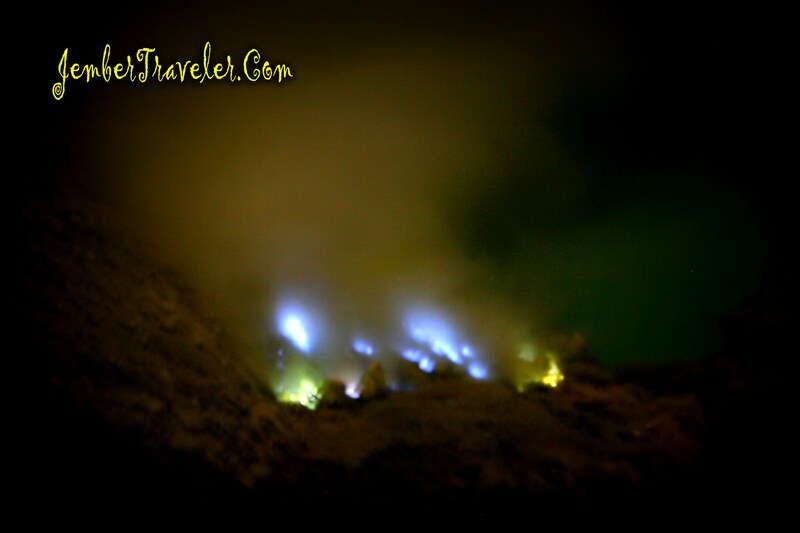 The blue fire is from the sulfur mines. It was extremely beautiful scenery to refresh our heavy eyes. To see the blue fire in a close distant must be accompanied by a miner because the path is narrow and steep. Daniel made a tent on the ground we were. We slept closely to make it warmer. 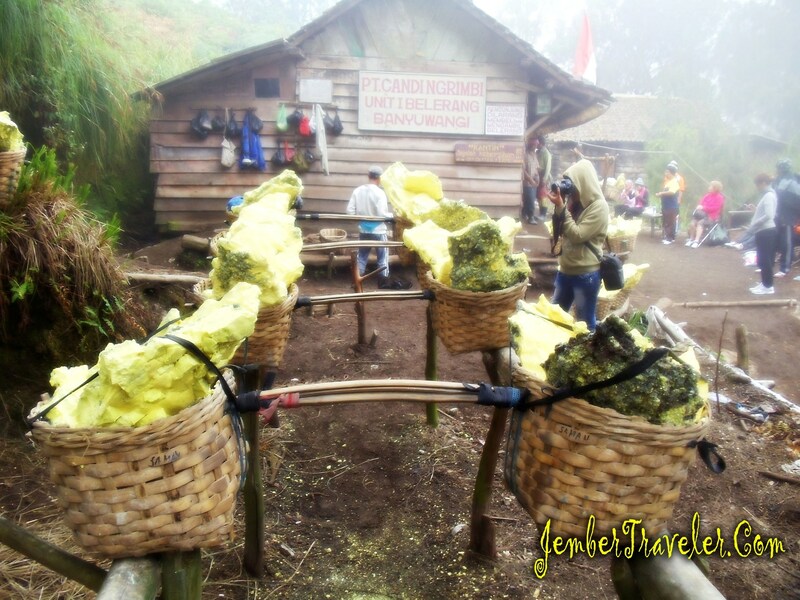 The group from the Ijen Festival was already arrived at the peak too. Some of our friends joined us sleeping in out tent. The sun showed us his face in the early morning. We joined the group to take pictures before they headed down. 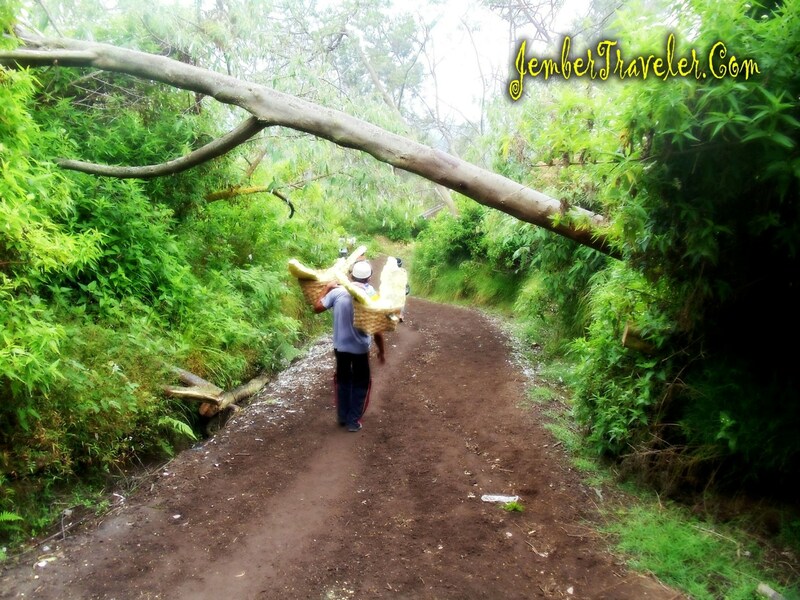 We followed the miners to go down bringing their load to a scaling place. 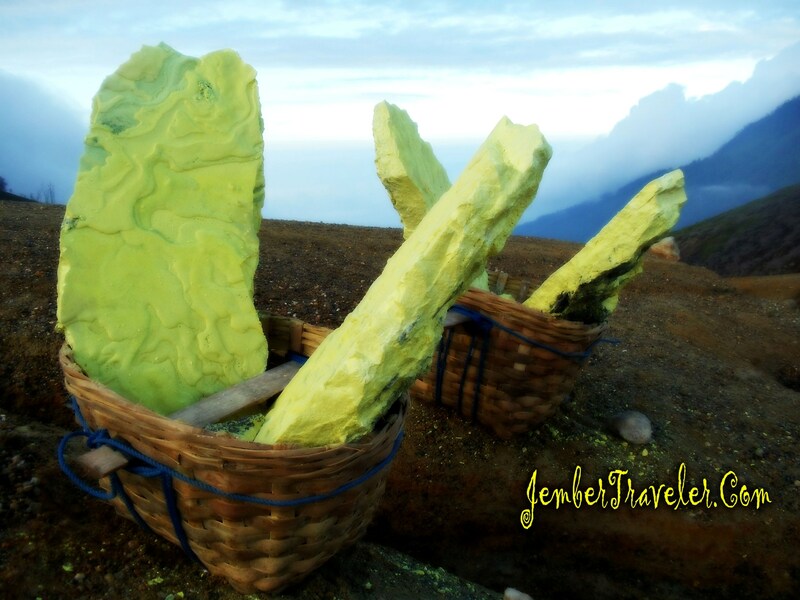 The weights of the sulfur they carried were around 60 – 70 kg for one route. I tried to carry one and I failed. 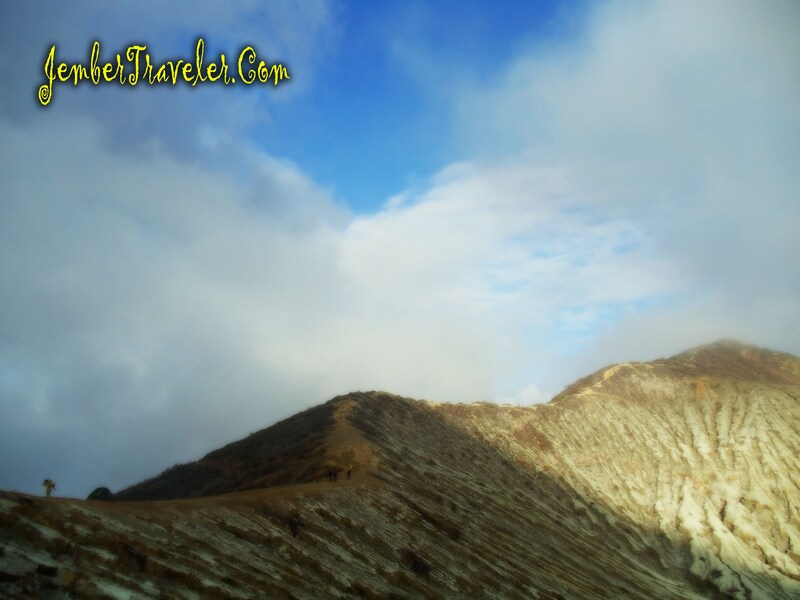 They are also creative by sculpting the small sulfur into the shape of turtle and mountain. 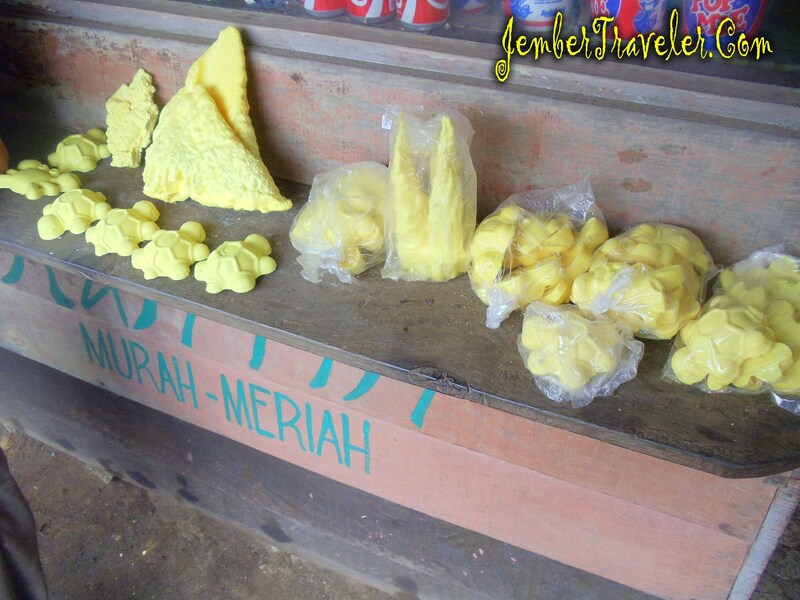 The price of that kind of souvenirs was around IDR3.000 – IDR6.000 each. 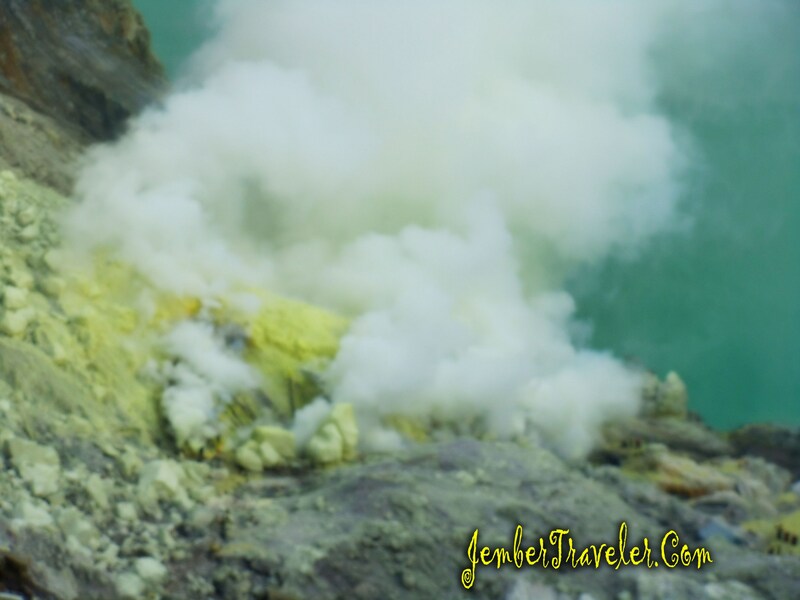 They offer it to the tourists enjoying Ijen Mountain. This number is quite high regarding their living. But the risk they have to face is also not a joke; like falling into cliff, got internal diseases, bruised shoulders for carrying heavy weight, even some of their back bones are shifted. The dangerous risks are ignored to make a living for them and their families. Amazed and touched, the only thing I can do listening to the story of the sulfur miners. 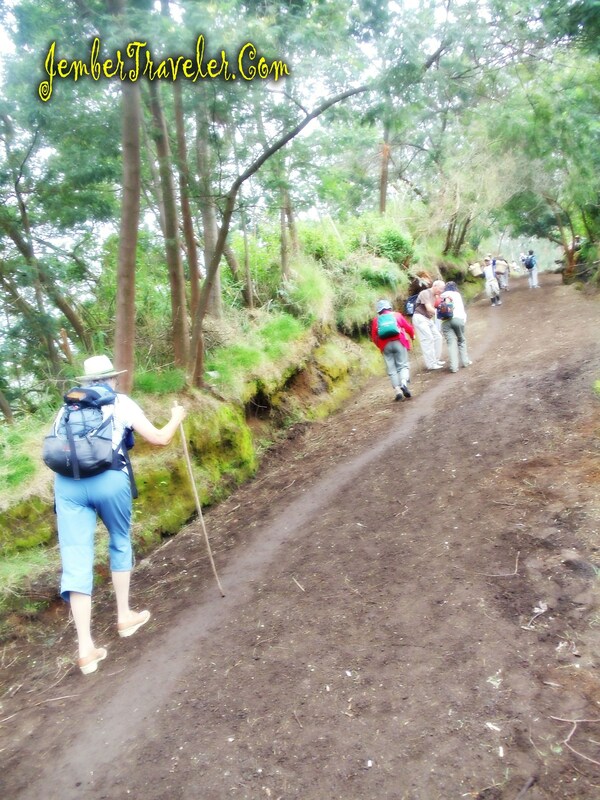 Before reaching the last post, I saw a group of foreign tourists hiking. Most of them were in their 60s. They looked happy and energetic; they were also fit and healthy. It burned my spirit who is much younger than them. On the last post, we had a break to continue our way home. Tired and sleepy, they were getting worse. So we decided to stop by the post I to take a nap. We slept for almost 2 hours. We crossed the bad and rocky roads again. The heat of the day was with us. Then, we stopped at a meatball café near the Bondowoso old station to have lunch and break. We ate a bowl of meatballs. Finally we rode to our houses in Jember. it was a trip taking much efforts. I thank God for giving me a chance to enjoy his art through the nature’s beauty.